Luxury retailing is all about the in-store experience, and digital signage — done well — can play a big role in creating the right environment to influence shoppers. 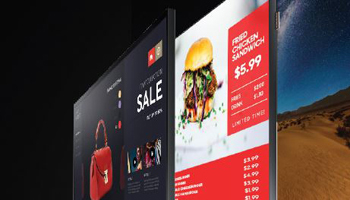 Digital screens located in the right places with high-quality content create a connection between the brand and consumers, generate great impressions and memories, and ideally convert store browsers into buyers. In the end, the goal is to enhance the relationship and make them regular, loyal visitors. Integrating digital signage displays into the in-store experience is not just about the tech, however. Putting in flashy screens that suggest innovation and create a “wow factor” is just a tactic, not a strategy. Big beautiful screens are now commonplace in retail and elsewhere these days, so whatever “wow factor” that might be generated will have a shorter half-life than a lot of fashion trends. There’s no reason to suggest a retailer with the biggest, brightest and most screens wins, and that’s particularly true in luxury retail. The key is to define the objectives of the store design and communications, and understand what shoppers want to experience when they walk through the front door. Luxury shoppers are different from everyday consumers, who are typically moved by price and value. Luxury or premium shoppers buy based on quality as well as the affinity and loyalty they may have to a brand. They know and fully understand there are lower cost alternatives for anything from clothing to accessories to automobiles, but they’ll pay the premium. Retailers covet those consumers because of their spending power. For example, BI Intelligence says the top 10 percent of U.S. household earners — those with $120,000+ annual incomes — account for approximately half of all consumer expenditures. BI’s research also notes that luxury shoppers are also attracted to convenience and experience higher recall from digital advertising. Retailers can make big statements about their brand through feature walls, using ultra-narrow LCDs or direct-view LEDs to deliver strong visual statements about the brand. Luxury apparel retailer Burberry’s London flagship store features a massive videowall that bisects the twin stairways rising from the main level to the mezzanine. The high definition content all relates to the brand, and is synchronized, at times, with other displays around the store. With direct-view LED walls, retailers can show ultra-high resolution, slow-motion visuals that reflect the engineering and design details of the product line, instead of distracting shoppers with extraneous text such as product price or technical specs. In a luxury environment, retailers generally avoid any mention of prices or promotions on screens. Luxury goods are about very high quality of materials and engineering and fine details. With jewelry, timepieces or apparel, large ultra-high definition displays have the volume of pixels needed to magnify the detail and celebrate the products on a much larger scale. Emerging display technologies like QLED and High Dynamic Range (HDR) show products at their best. For example, HDR capabilities built into Samsung’s QLED commercial displays means a mood-setting branding visual doesn’t have to strike a balance between the brights and darks. It can fully show the brightest brights and darkest darks, without losing detail. Plenty of experts say the key to great in-store experience is knowledgeable, attentive store associates, but in busy shops, immediate one-to-one dedicated service isn’t always possible. That’s where interactive digital plays a role. First, interactive displays can provide a wealth of product knowledge — from the story behind fragrance design to high-end audio options on a luxury sedan — that entertains, informs and even pre-sells shoppers as they wait for busy sales associates to come free. Digital mirrors in dressing rooms are starting to be used by high-end apparel retailers as a way to make shoppers aware of color and size options, and accessories, while they’re in the fitting room. The displays look like mirrors, but have LCD technology embedded in them to make them informative and interactive. Some retailers are testing dispatch capabilities from the screen — so that a woman who likes a dress, but needs a smaller size — can use the screen to request that item be brought to her fitting room, without needing to get fully dressed and return to the sales area. This helps develop the idea to shoppers that luxury retail is not just about products, but also the overall experience. Retailers — from Sephora to Mercedes — are trying new small-format stores in the high-rent central districts of major cities, using digital displays to supplant physical inventory. For a cosmetics retailer, an interactive digital screen provides “endless aisle” capabilities — meaning what’s not in the store can be ordered and delivered there or to a designated address. For Sephora, a Paris store that’s less than 10 percent the size of its flagship store in the city could still virtually carry and sell all 14,000 SKUs in Sephora’s cosmetics universe. Additionally, auto dealers are putting a single vehicle in high street sales centers, and using videowalls and interactive car configurator screens to show the product range and start the selling process. If the consumer wants a test drive, that can be quickly arranged, using demo cars parked nearby. Both of these applications can not only help with inventory management, but also help create a more interactive shopping experience for luxury customers. Look around most luxury retailers and you will see digital very carefully selected and designed into the overall experience. It’s not about the flash of digital, but what this technology can convey and deliver for the brand and the customers. Get that right, and business can cultivate a store where shoppers will want to return. To draw in new customers, many stores are turning toward experiential retail, which relies on technology like mirror displays and digital signage to attract shoppers.